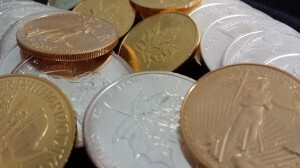 What do your gold and silver customers value most? What aspects of bullion investment and coin collecting have turned off previous customers? Frank: You can’t predict what’s going to happen five years from now, or ten years down the road. So, the only thing you can hope is it’s going to go up. But—you can’t guarantee. We had platinum a couple of years ago at 22 hundred an ounce, people bought at 22 hundred an ounce. Now it’s down around 15 hundred, somewhere in that ball park, so they lost 7 hundred dollars per ounce. Same thing with silver. We had some women come in here and spend over four thousand dollars for a hundred ounce bar of silver. Okay, now we’d be selling it around 22 hundred a bar. So, yeah, that could turn people off. Jack: That’s what a market does. When the market goes down, you lose money on your stocks, your bonds, your bullion, your whatever. Frank: Real estate, same thing. It’s really not our fault that it happened. It’s the economy, or it’s, you know, fifty million other variables. Jack: I’ve had customers sit in front of me with recent deaths, and they’re selling their coins, and they’re crying. 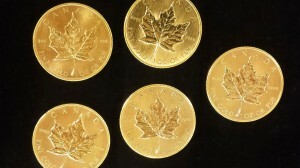 I’ve had people come in that are selling gold and silver coins they’re losing money on. 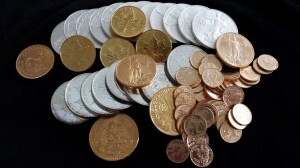 I’ve had people selling gold and silver coins that they’re making money on. I’ve had people come in and buy it for presents, I’ve had people that buy it for investments. What turns them off? Being cheated. Being sold something that is not what it is, or way over priced. You want to see what turns coin collectors off? Right here. These coins were bought off the TV with three easy flex pays of $39.95. Now it’s in my half-off bucket for three dollars. And I bought it for face value. What turns these people off? Being deceived by the big TV and media advertisers. What other questions might customers like to have answered? Ed: They want to know what the price of gold and silver is going to be. [Laughs] They want us to tell them it’s going to be two grand next week. Jack: You know what I tell them when they ask what is the future for bullion? I say, “I can’t tell you what it’s going to be, but I can tell you this. For the last ten years, the general direction has been up.” And that’s my pat answer for them. And that always works. And that’s a totally honest answer. Do you sell silver for the precious metals value? Ed: Yes we do. We sell 90% silver coins (1964 and before). We sell pure silver 1 oz coins, new manufacture. We sell pure silver bars of various sizes. How often do you show the customer the Kitco price chart for precious metals? Ed: Several times a day. They want to see it. Jack: They all have iPads and iPhones and they’ve got it on there as they walk in the door. Ed: They’re all looking it up.